Check out some of the best snowy getaways and start planning your very own white Christmas! Spend your Christmas in Oslo for an almost guaranteed white Christmas. The capital of Norway, the city buzzes at Christmas time with concerts, markets and other festivities. Beat the cold with some traditional gløgg, a festive mulled wine drink, or head outdoors and explore some of the world-class ski resorts located just outside the city. Whether you’re a keen winter sports fan or are just visiting for the festive experience, Aspen is a winner for its old-world charm. 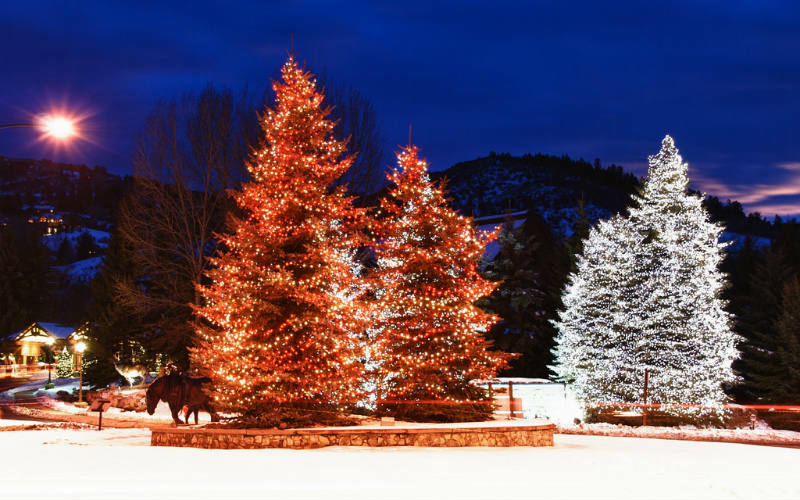 Famous for its ski slopes and snowboarding fields, Aspen transforms its town centre into a winter wonderland each year during the festive 12 Days of Aspen festival, offering plenty of ways to while away the hours in the days leading up to, including and following Christmas. Cosy up in a cabin, hit the slopes or immerse yourself in Aspen life. Aspen, United States of America. Image Credit: Jim Nix / CC by NC SA 2.0. Canada is well known for its heavy snowfall and cold temperatures during the winter months, and Montreal in particular is almost certainly guaranteed snow at Christmas time. The city comes alive with Christmas parades, and the downtown area is littered with sparkling Christmas lights. If you’re stuck for things to do, you’ll find a number or great events taking place across Montreal, including the famed annual Les Grands Ballets Canadiens de Montreal’s performance of The Nutcracker. Celebrating a white Christmas in New York City is an entry on many travellers’ bucket lists. Although there’s no guarantee that there’ll be a white Christmas in the city, what it may lack in snow, the city definitely makes up for in festive cheer. 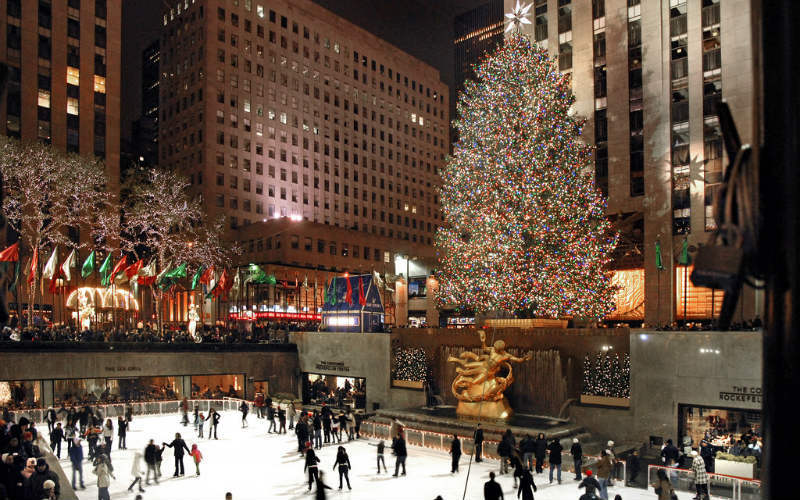 Immerse yourself in the holiday spirit with ice skating in Central Park, a stroll by intricately decorated department store windows or with a visit to the Rockefeller Center Christmas Tree, which stands at close to 30 metres. New York City, United States of America. Image Credit: Angelo Amboldi / CC by ND 2.0. Set in southern Sweden, Stockholm offers visitors a pretty good chance of enjoying a white Christmas. Spend time in the city and marvel at the traditional Christmas markets filled with toys, homemade gifts, pepparkakor (gingerbread cookies) and mulled wine, or head beyond the city’s edge and hit the slopes at one of the nearby ski resorts. 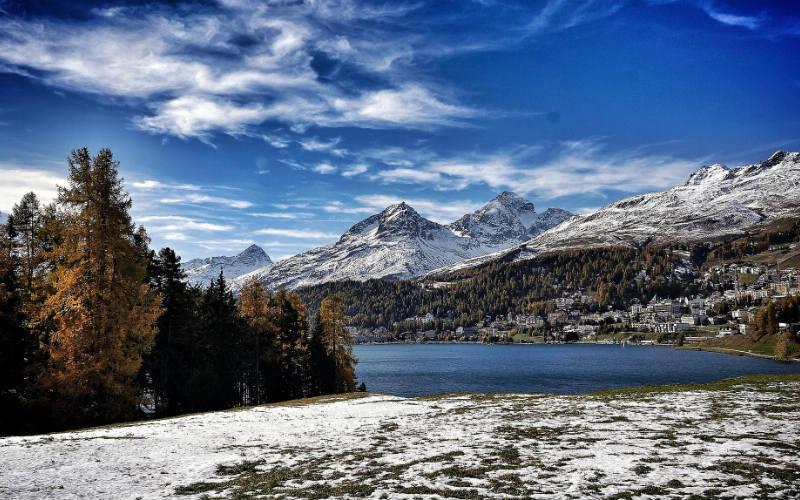 Switzerland is truly magical at Christmas time, and nowhere more so than St. Moritz. With 9 five-star hotels in the town, it’s where the rich and famous spend their Christmas holidays. There are plenty of opportunities to take part in winter sports such as skiing and snowboarding, and certainly no shortage of spectacular mountain views. St. Moritz, Switzerland. Image Credit: ND Strupler / CC by 2.0. Spend your Christmas in London this year and experience a traditional, English white Christmas. Central London itself has less chance of snow, but the surrounding suburbs of Greater London are generally expected to enjoy a dusting of snow. Visit Hyde Park’s Winter Wonderland for Christmas markets, food and drink, and fairground attractions, shop for gifts at world-famous department stores such as Harrods and Selfridges, or experience the magic of Christmas at Hamleys, the world’s oldest toy shop. 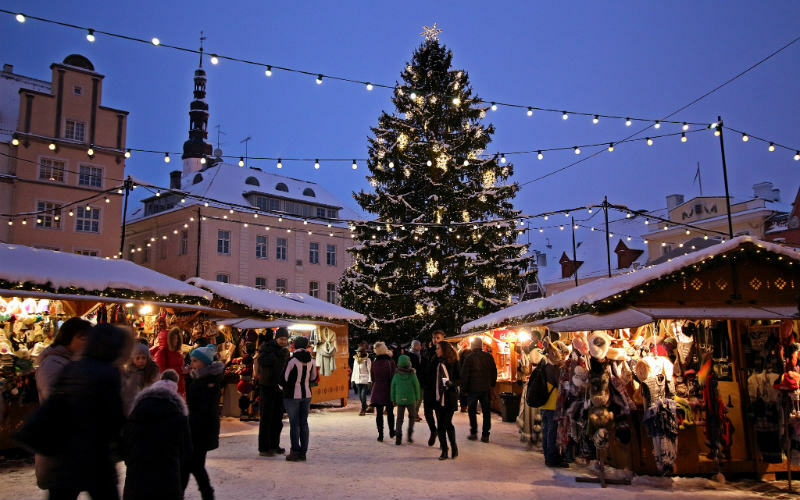 Located in northern Estonia, the country’s capital, Tallinn, offers one of the best chances for a white Christmas in the Baltic region. Each year, following 15th century tradition, a Christmas tree is set up in the medieval Old Town, and the town square is filled with Christmas markets to mark the occasion. Wander through cobblestoned streets and enjoy the festive events which run well into the new year. Tallinn, Estonia. Image Credit: Marit & Toomas Hinnosaar / CC by 2.0. Said to have been the only European capital to enjoy a white Christmas in 2015, the capital of Iceland, Reykjavik, offers good odds for those looking to enjoy a Christmas day blanketed in snow. The city lights up the streets during the Christmas holidays, with plenty of great events taking place in celebration of the festive season. Head to local Christmas markets and try some Laufabrauð, wafer-thin wheat bread pieces cut with decorative patterns and deep fried, which is enjoyed during the festive season. 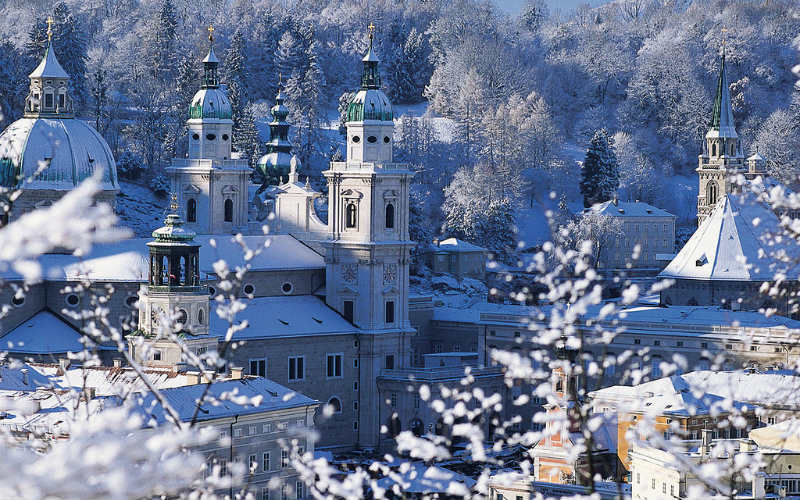 With pretty good chances of December snowfall, travellers flock to Salzburg for a traditional white Christmas. The city is famous for its Christmas markets, with the most popular being Salzkammergut, which sells handmade trinkets and gifts, as well as popular local savoury and sweet treats. Located in the Austrian Alps, there are plenty of opportunities for skiing and winter sports options beyond the city’s edge. Salzburg, Austria. Image Credit: Susanna Gappmayer / CC by ND 2.0. Looking to enjoy your own white Christmas? Compare cheap flights and great hotels with Webjet today!